What's not to love about this? My sister, the very same sister superhero of my renovation summer, sent me a package that arrived this weekend. I'm terrible at waiting if it isn't Christmas or birthday, so I just went on ahead and tore into it. And you see above, my lovely Valentine's Day gift. My sister is a painter (I just love saying that. I love bragging on her talented behind). And the little nuthatch on a branch is just what the doctor ordered for my usual mid-February slump (I'm not much on winter). It's a nice perk of sisterhood with Dyan that I get the blessing of her talent. She also paints pet portraits and jewelry: her Etsy Shop is here. 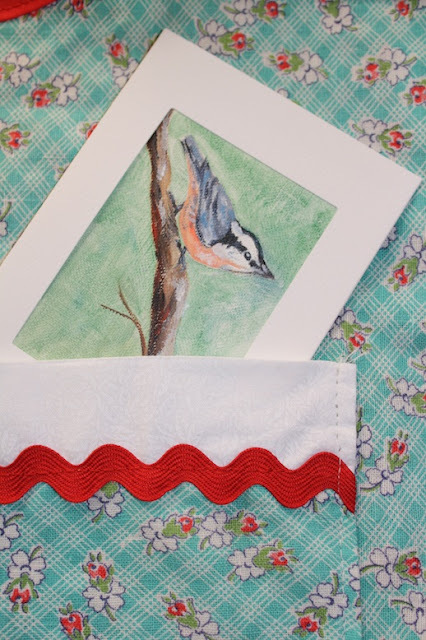 The little ACEO (Art Cards Editions and Originals, if you've always wondered) came in the pocket of an apron, also made by my sister. 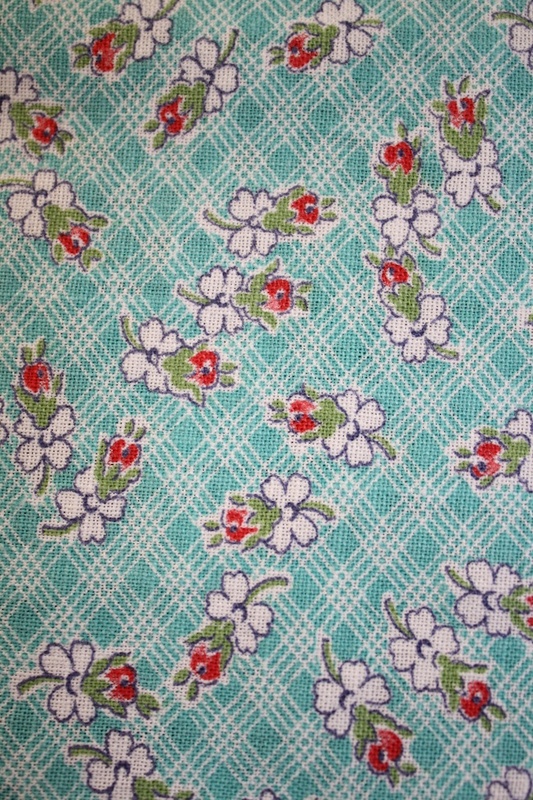 Aqua floral, crisp white, and red ric rac. How can you go wrong? 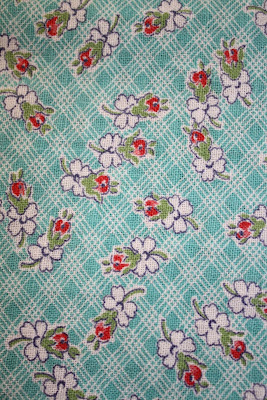 The aqua print is from a vintage feed sack that came from the fabric stash of our Great Aunt Elizabeth. Aunt Elizabeth passed away last November, and we miss her. She was a school librarian and band director/music teacher in rural Missouri schools her entire adult life. She was a little prim, but she was smart and good and an enthusiastic follower of all her many great nieces and nephews, since she never had children of her own. It's a gift with the extra sentimental value built into every stitch. I hope you had a great Valentine's Day too! I love you too, sister! 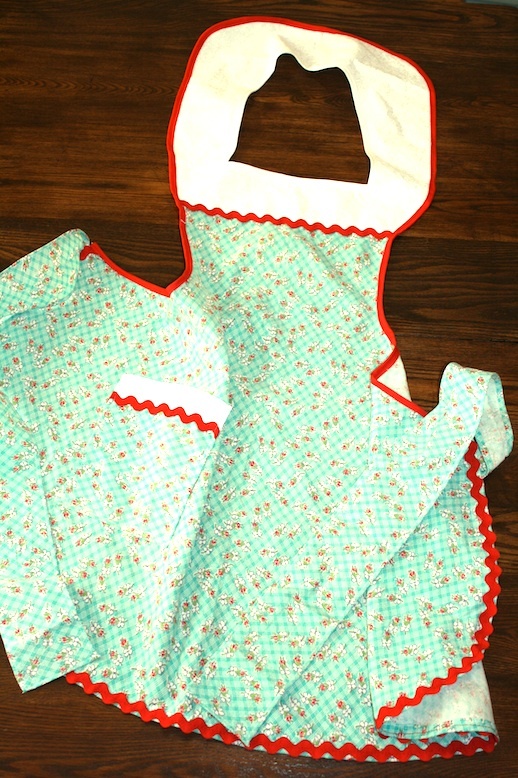 If anyone wants to make this apron, I got the pattern (Retro Chic Apron) from Sugar Pie Chic on Etsy. She also sells pre made ones. Super cute! OMG. I just went to her site and I think I want one of each! very cute and starchy! What wonderful gifts! Love that little nuthatch! I am so jealous! I love the apron and the fact that the fabric is compliments of Aunt Elizabeth makes it even better. I miss her, too.